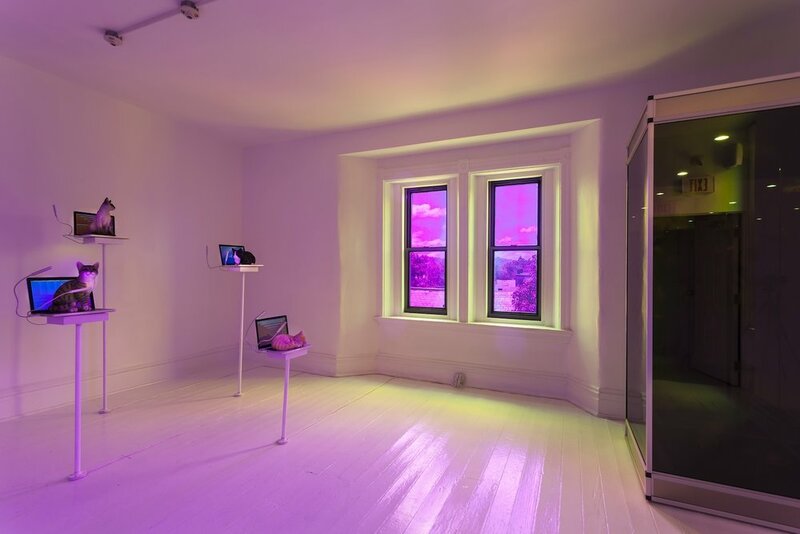 IRIS_SIRI was a site-specific installation at the Mattress Factory that explored the utopic and dystopic potential of the Internet, the omnipresent spectacle of screen time, the mirage of capital, and the effects of rapid technological acceleration on the human species. The title is a palindrome that references Iris, the goddess of the rainbow, and Siri, the goddess of the smart phone. With these works, I aim to embrace both utopia and oblivion, approaching the complexity and messiness of our current moment with humor, beauty, and a critical undertone. Each window of the space is covered with dichroic window film, which simultaneously floods the interior with vibrant gradient shifts and provides a prismatic lens to view the outside world. The saturation, light level, and gradient shift will change over the course of each day as the sun shifts position in the sky and weather conditions change. 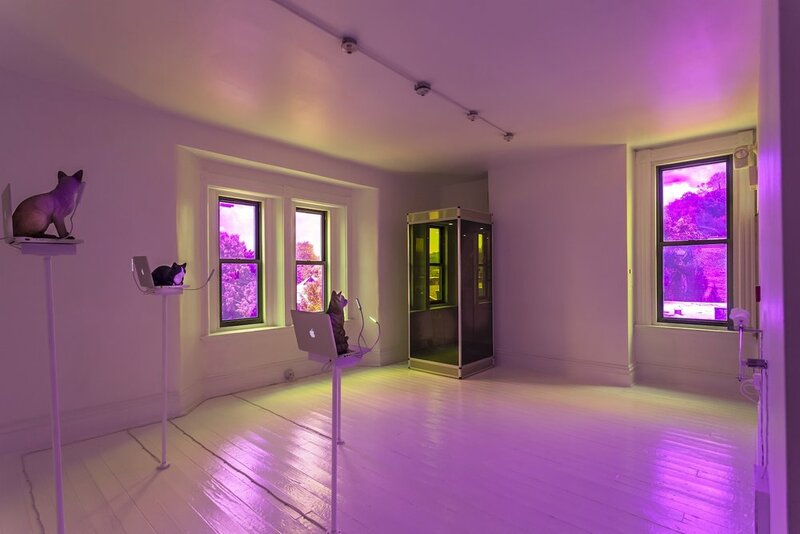 This atmospheric light shift alters and heightens our perception, not only of the works in the installation, but of the world we will return to. Other worlds are possible, other worlds are necessary. 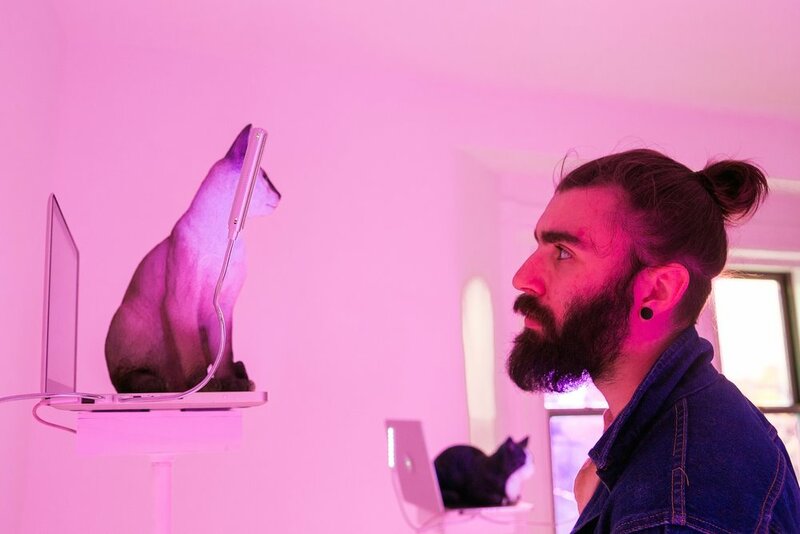 Resin cats sit perched upon laptops obscuring hypnotic cascades of infinitely accumulating browser windows. The cat is the spirit animal of the Internet and the primary symbol for our culture of distraction. A free and open Internet, like all forms of communication technology before it, has the revolutionary potential to educate, agitate, and organize the masses. In counterpoint, systems of power seek to use the spectacle of the screen to distract us and manufacture consent. Will the revolutions be digitized? Will the revolutions be monetized? Or will the revolutions simply disappear from our feeds? I have automated a capacitive replica of my hand to scroll infinitely on an iPad in a disembodied drone. We are entering a new era of perpetual screen time. We are always on, always connected, and rapidly merging with our devices. Our phones are quickly becoming the most ubiquitous and intimate objects in our lives. We scroll habitually, often loosing sight of what we were actually searching for. What are we searching for? What void are we attempting to fill? A dark pool of money circulates into infinity within the mirrored confines of a custom fabricated cash cube. This work explores the historic levels of wealth inequality we are experiencing and the mirage of capital. Money is used as a lure to keep the people at the very bottom of the very steep pyramid focused on climbing upward toward an unreachable peak. In this work, we have a glimpse into unfathomable wealth, but it is an illusion, a cheap trick of smoke and mirrors, and we are always locked out.